Overall, we use a diversified style, whereby we emphasize different strategies depending on the market environment. 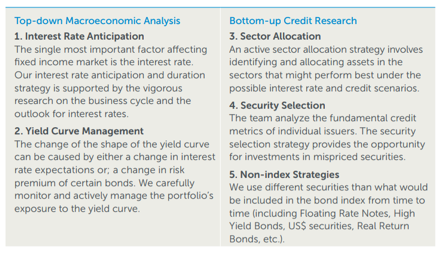 Typically interest rate anticipation and/or sector selection have the most impact in terms of the five strategies. In keeping with our values, our priorities are safety of principal, income (yield) and moderate capital appreciation. Once we have completed our top-down and bottom-up analysis, we carefully select individual fixed income securities for our funds. By only selecting investments with the right safety and return characteristics, we are able to protect and build investments. The expected outcomes of the strategy are competitive risk-adjusted returns and a low correlation to equities.